Hungary will withdraw all of its 300 troops stationed in Iraq by the end of March 2005, the country's prime minister has said. Ferenc Gyurcsany made the announcement at a military ceremony in the capital Budapest on Wednesday. He said Hungary was obliged to keep its troops, who have a non-combat role, in Iraq until after elections in January. There has been intense pressure from the public and opposition groups to pull them out. The main conservative opposition party initially supported the war but changed its position and now favours withdrawal. Mr Gyurcsany, who was chosen as prime minister in August, made the announcement at a ceremony marking the end of compulsory military service in Hungary. "We are obliged to stay there until the [Iraqi] elections," he said. Even to keep troops in Iraq to the end of March will require parliamentary approval. 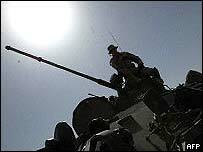 US State Department spokesman Richard Boucher said Hungary's intention to keep troops in Iraq for the first three months of 2005 was what the Iraqi government requested. "That's the news today and that's good and we welcome that." The Hungarian troops are based in Hilla, south of Baghdad, and are under Polish command. One Hungarian soldier was killed in June when a convoy he was guarding was hit by a roadside bomb. Government spokeswoman Boglar Laszlo told the Associated Press news agency that the Iraqi government had asked Budapest in a letter three weeks ago to extend its troops' mission by about a year. Poland announced several weeks ago that it would start to reduce its 2,500-strong contingent in January and was considering a complete withdrawal by the end of 2005.